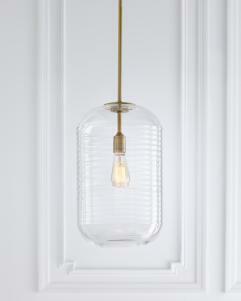 Inspired by classic bee-hive jars found at a vintage flea market, the Arlon Collection of pendants features glass with a subtle ripple technique which is created in the glass blowing mold. This generates an elegant shimmer effect when lit. Arlon is available in a Burnished Brass or Polished Nickel finish. 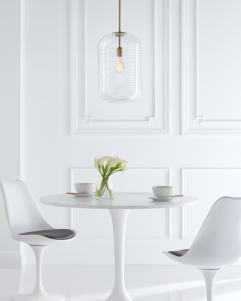 Making a bold minimalist statement, Arlon is an artsy, postmodern fixture. Use for overhead lighting in kitchen, dining and common areas for distinguished décor.